Well Hogan redeemed himself today. I felt awful again yesterday, but promised myself if I could, I'd take him out this morning. Beautiful morning, mild and sunny. I only intended to plod, but we did more trotting than we've ever done, and he was lovely and forward going. Massive tractor coming along our narrow lane, and he didn't bat an eye. Ramsey would have been in the ditch, bless him. He's now not even pausing as we pass the forest ponies (Yes, they're still there!) I'm going to make our next challenge, after a few more weeks good trotting, to try a canter. He should be fit enough. My legs were a bit shaky when we got back, but otherwise I think it did me good. He earned his hay today! It was a little windy but nothing like its been. All 3 possibles looked pretty good. Today should be a decent just breezy day again hopefully more riding. Things are getting greener day by day too. Well it’s been so long since I updated here I’ve lost count of what I’ve done when, so if it’s ok I’m just going to post when I remember and try to include the odd photo, also when I remember. Today’s little pootle is one of my favourite rides but because I’ll only do it on a Sunday it’s not one I often do. A small maybe 5/6 mile hack along our main road and a loop of the local quarry back to the main road, under the A5 on the way into the quarry, over it on the way back, have attached a photo going towards the ‘under pass’ but I’m way too scared to take my hand off the reins going back over it, it’s a good sized bridge but the safety rail is maybe 3ft high and when you are on horseback your well above it and it’s a long way down onto 70mph traffic if you fall! How lovely! You sound full of the joys of spring! Love the pink ears! Know that going over the bridge feeling - way back in riding school days used to cross on a footbridge over the motorway - didn't realise I was holding my breath until I nearly passed out. It IS a scary feeling!. Went out for 2 hours today with our rock solid bestie. So chuffed - went out of the inclosure and rode beside the road. Good as gold, unfazed by traffic and the wide open space. Will take my courage in both hands and go on my own on Tuesday. This all sounds pretty pathetic progress, I know, but a year ago I didn't think I'd have the nerve to get another horse, much less one that hadn't been ridden for 2 years. I'm loving building a relationship with him, and the feeling that he's beginning to think that life with me's pretty ok.
Would people mind if i joined in late please? Well Monday I paid the months rent on my new yard see playing ponies my diary. In members diaries. Spent all week moving and sorting and today we rode for the first time since Saturday. I just hacked round my new seven acres it was great fun. I have a wonderful spring and summer ahead. 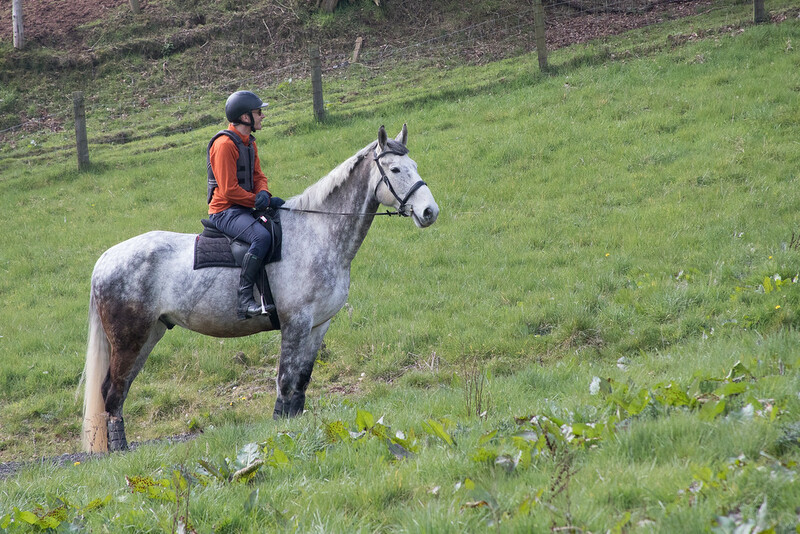 There’s a school five mins hack away £8 an hour and two bridleways 100 yards away . What a striking looking boy! Looks very laid back. I was planning to go to the same fun ride as Domane this weekend but I had nobody to ride with and it was very busy last year so I decided to give it a miss. Instead I managed to get a place on a local jumping clinic. 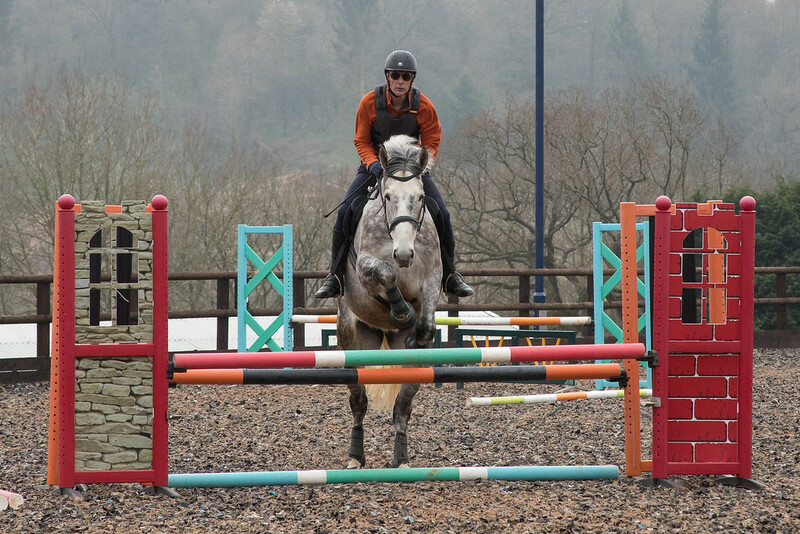 It seems ages since I have jumped so on Saturday I had a practice at home and it was just as well as Harvey was a bit mad. He started off by deciding he had to gallop at the jumps so I had to spend a while cantering past the jumps before he settled down. We eventually managed to work up to a single fence of 100cm. The clinic on Sunday went well. It was supposed to be a 70/80cm class but I had arranged in advance that it could be put up to 90cm at the end for me. As it turned out one of the other riders jumped at 90cm too. Our yard groom came to watch as she hadn't seen a clinic before and seemed to enjoy it. 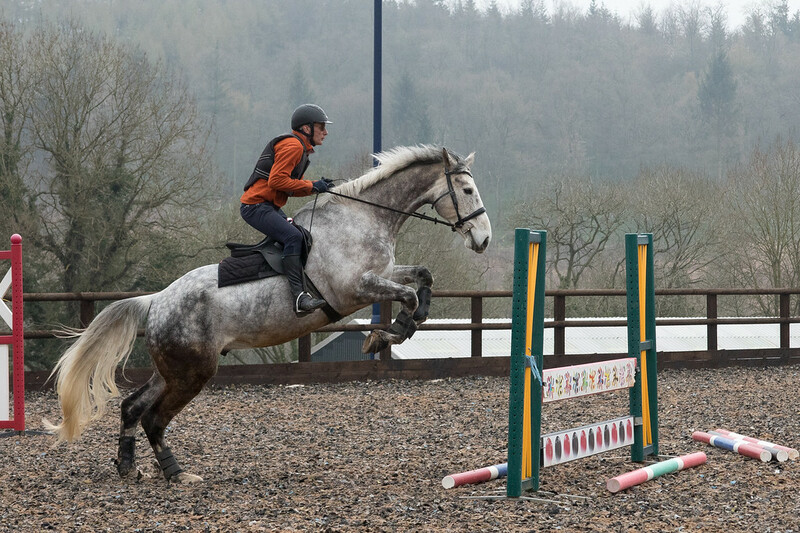 Wow - that's a scopey jump he's doing in pic 2!!!! Well done, clearing from that distance! I don't call him the mad grey thing for nothing He doesn't do it very often, but at least now I can feel it coming and don't get as left behind as I used to. Was very lucky this morning, and got an hour and a half before the rain came on. Wimped out of going out of the inclosure, partly because in the distance I could see 2 riders trotting quite fast, parallel to the route I would have taken. Big coward that I am! Having said that, Hogan was aware if them, and mainly just looked, tripped up once through not concentrating, but all in all not too bad. In the end we had a good ride, trotting up nicely, doing some halts and half halts. Love the little black tips! Comet had yesterday off from ridden and we went for a nice in hand walk, met some trains again and a tractor and lots of scary pheasants! Hacking this week 8 hrs. Have now chickened out twice on going out of the inclosure! Was going to on Thursday, but in the distance saw a woman I know whose horse is mental. Could see she was having a bit of a hoolie with him, so again, stayed safe! However, to be fair, met a MASSIVE car transporter on the lane, lights flashing the lot, and superstar Hogan went past in a very narrow space, like a little gem. Then on the way back, two transit vans, back to back, transferring stuff from one to the other with a trolley, once again passed it like a pro. Fingers crossed will get further out next time! Short and SAFE is always better. Nice play in the little cavaletti pen great w- t- c transitions. Played with touch it and umbrellas.